AccuraCast SearchStarz Blog: Could McDonald's Be Making A Huge Mobile Mistake? McDonald's have announced that they will be launching a new packaging design, that incorporates their nutritional information in the form of a QR code. Although McDonald's feel that this is a positive step, I think that this could actually be a step that may damage their brand. The problem of obesity is growing quicker than the average wasitband size of today's children and this has placed a huge amount of pressure on the likes of McDonald's and Coca Cola, who people expect to act responsibly. The American fast food chain believe that they are taking a step to "engage with customers in relevant ways and celebrate our brand", but in my opinion they have failed to look at the bigger picture. 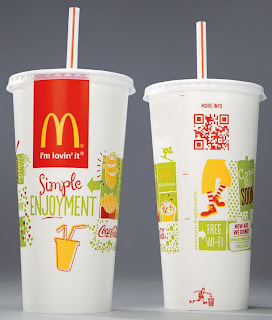 My question to McDonald's is how many customers will use these QR codes to enter the nutritional information into one of the thousands of calorie counting and nutrition apps available? As the global population become more health conscious, I would say that this number will be considerable. Once their customers are presented with the horrendous health implications of their McDonald's meal, how many of them will be deterred from returning? It will be interesting to see how this works, let me know your views!